Julie A. Gorges an award-winning journalist, author, and blogger at BabyBoomerBliss.net, recently recognized as one of the top baby boomer blogs on the web. Her work has appeared in dozens of national magazines. 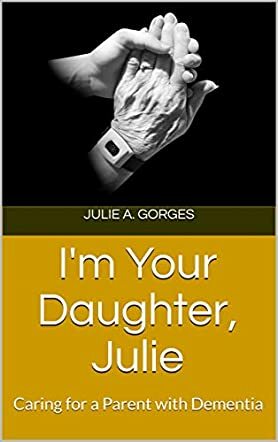 Her latest book, I'm Your Daughter, Julie, shares her intimate story as Gorges cared for her mother suffering from Lewy Body dementia. She provides a compassionate and supportive guidebook to help caregivers cope with the many difficult challenges and emotions they'll encounter on their difficult journey. I'm Your Daughter, Julie: Caring for a Parent with Dementia by Julie A. Gorges is a powerful book about Lewy Body dementia and other forms of Alzheimer’s. It is a caring, heart-filled story of a daughter’s journey with her mother, as they both face the monster of an illness that steals so much. In this book, Gorges touches on many aspects of caring for her mother as her health and mind deteriorate. Through this, she conveys understanding of the overwhelming job of looking after a loved one in a dignified and loving way, not only for the loved one but for the caregiver as well. There is a great deal of love in I'm Your Daughter, Julie. The author shows her tremendous affection for her mother despite the challenges and pressures that accompany caring for someone suffering from Lewy Body dementia. In addition to caring for her mother, Gorges goes further and presents helpful information for anyone in a similar situation. She not only describes her journey but gives help and hope to others. This is one of the many reasons I found this book a moving experience to read. As someone whose mother is elderly, I found many of her suggestions helpful and presented in such a way as to take away the pressure to endure. Gorges brings understanding to a situation that can cripple families with guilt and fear. And she does this with an honest portrayal of her own journey. Thank you for a great read and wonderful advice.